During the information day future users from the vertical sectors will have the opportunity to learn about the features and capabilities of the infrastructure and how to use it in order to deploy innovative applications in the vertical sectors. 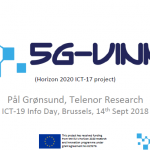 5G-VINNI (5G Verticals INNovation Infrastructure) is a pan-European research and innovation project financed by the EU’s Horizon2020 programme. 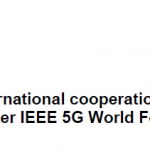 5G-VINNI facilitates uptake of 5G in Europe by providing an end-to-end facility that validates the performance of new 5G technologies, and explore solutions for vertical industries such as public safety, eHealth, shipping, transportation, media and entertainment and automotive. The project, which is coordinated by Telenor Group, is scheduled to run for three years at sites in Norway, UK, Spain, Greece, Germany and Portugal, and has a budget of 20 million euros.